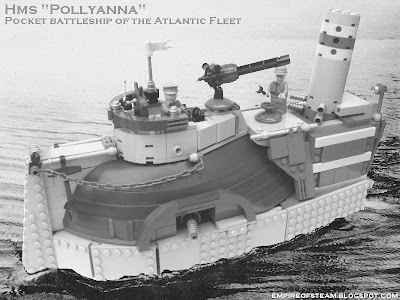 The Pollyanna is a fine example of the P-Class pocket battleships which formed the backbone of the Imperial Atlantic Fleet from their introduction in 1852 until their replacement with the D-Class Destroyers during the 1890s. This particular vessel, affectionately named "Polly Pocket" by her crew, saw extensive action during the Gibralter Incident of 1866, and was responsible for the sinking of seven Seccesionist gunboats. In the Great Winter Storm of 1871, the Pollyanna was to engage in a daring and heroic mercy mission, delivering much-needed food and medical supplies to St Kilda. The islanders had been denied airship supply for three months due to the appalling weather, and the situation was becoming desperate. Defying terrifying seas, and the rocky approaches to the island, the Pollyanna completed its mission, undoubtedly saving many lives and earning the Captain and crew a letter of commendation from Her Imperial Majesty herself. The interested reader may view more photographic images of the Pollyanna here.